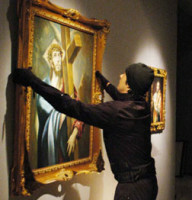 The idea of a billionaire criminal mastermind in some sort of underground bunker filled with stolen masterpieces is, as Dr. Samuel Andrew Hardy discusses in this must-read paper, one of the most enduring art crime tropes. It comes up in a ridiculous number of films and books (e.g. Benicio Del Toro on playing “The Collector” in Guardians of the Galaxy), not to mention in just about every conversation that I have with random folks about what I study. Hardy casts this idea as rightly problematic in its fictional form, but asks if the core idea might actually be a reasonable economic model. He notes that while “looting-to-order” known art masterpieces and museum collections is problematic in every sense, antiquities looting isn’t. Artefacts looted from the ground lack any prior records and thus any clear trace of their illicit origins. The commissioning collector of antiquities, then, can display their ill-begotten wares out of their bunker, above ground, for the world to see. This is important to remember. So Hardy did a number of key-word searches on Google (check the paper for the specifics), discarded the ones that were unclear or not relevant, and came up with a number of cases of looting-to-order in art and antiquities theft. Those are cool, certainly read those, but what I think is really valuable about this section of the article is that Hardy makes a wonderful and important distinction that I hadn’t fully thought through before. He differentiates “collector-directed” robberies, which is how he defines “theft to order”, and “dealer-driven” robberies which he refers to as “predictive theft to order”. There is a fundamental difference between a collector hiring looters to loot a certain object or object type for their own private collection and a dealer sourcing certain antiquities from looters because there is probably a market for it somewhere. The core difference is the motivation for the commissioning person (the collector or the dealer) to engage in criminal activity. The dealer does it for profit. The collector does it to have the object. There is totally a criminology paper in that distinction. Wanna co-author it with me, Dr Hardy? I do have some beef with the tense choice at some points in this article. For example, Hardy says “direct employment of looters by local dealers…**is** the most common arrangement in Belize”, citing a paper from 1991 (my emphasis). Perhaps it WAS like that in the past, but it certainly isn’t the case in Belize now. I’ve seen nothing like that kind of structure since the first day I walked into that country in 2003. I am also not sure how valuable citing Indian crime stats from the late 1970s is in anything other than a retrospective sense, a sense that is probably valid for the subject of the article, however Hardy phrases it as “if only 0.33% of India’s reported antiquities theft cases **are** solved” (p. 3–4; my emphasis). It should be “were”, not “are”: there is a lot going on in India these days, some of it clearly what Hardy defines as “predictive theft to order”…and that he uses as an example in the text, but none of it like what was going on in the 1970s. I get caught up in tenses, but I’m probably the only one that gets grumpy about such things and I think it is clear what the author means. Hardy, as he fully acknowledges, is dealing with a chronic lack of official info on antiquities trafficking generally, and the looting-to-order phenomenon specifically. Full disclosure: I’ve hated on the idea of ‘theft-to-order’, sometimes publicly, sometimes in a way that results in a very cool email exchange from high quality researchers (they were cool and high quality, I was rather lame). In this one case my hatin’ and emailin’, along with Peter Campbell‘s (emailin’ that is, he wasn’t hatin’) resulted in a blog post here, and contributed in a tiny way to pushing Hardy to write this paper. Hardy’s research “has amassed significant evidence of theft-to-order of cultural goods”. Based on his clear definitions, I can think of quite a few more cases. That leaves me with the lingering question of why was I such a hater in our email exchange or, rather, why do researchers like me dismiss the idea of art theft to order out of hand? The obvious reason, I think, is that it is SUCH a media trope and we, too, start to see it as fiction, a fantasy that every single person at every single dinner party asks me about (sigh). The other reason is related: because of the tv-trope-esque nature of looting-to-order, it may be that we have been suffering from a lack of a clear academic definition of the concept. You know what? That’s exactly what Hardy’s article provides. You should totally read it.